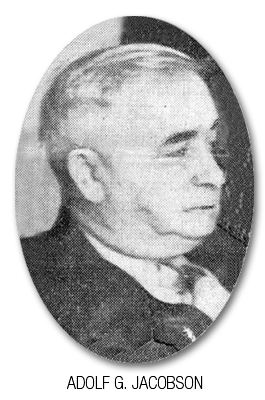 At 1:20 in the afternoon of April 17, 1941, City of Superior Constable A. G. Jacobson was shot three times as he was serving an eviction notice to Walter Karo of 701 22nd Ave. East. The wounds proved fatal, as Constable Jacobson died the next day. This sad story started two months earlier, as the first eviction notice had been served to the Karo family, a family of nine. As a temporary halt to the eviction, Karo reported an outbreak of chicken pox in his house, which then had to be quarantined. During this period of quarantine, Karo was able to get out and procure a .32 pistol that he had used as a threat toward his family. Karo even had one of his daughters unload and load the gun in front of his family to show them it was loaded. Reports of this gun and his actions got to the Superior Police Department, and they attempted to find it, but were unsuccessful. On the day before the shooting, Constable Jacobson had gone to the Karo home with a priest in order to help them find resolution to their housing problem. During this visit, Karo “…brandished a revolver … and declared that he ‘didn’t like people who stuck their noses into his business’.” This brought an abrupt end to this assistance. With great dedication to his public service, the unarmed constable returned the next day to fulfill his obligation and served the fateful eviction notice to Karo. Police officers go to work and unselfishly perform their duties knowing fully that this could be their last day. It is with this spirit and dedication to service that Constable Jacobson will be enshrined as a reminder of all those lost in the line of duty. 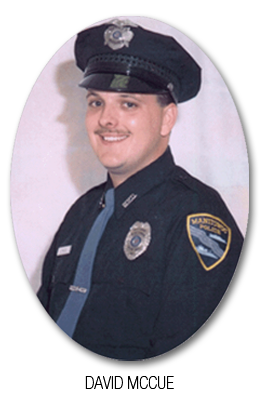 At 7:45pm, November 25, 2000, a call came into the Manitowoc Fire and Police Departments for a report of a house fire on Cleveland Avenue. While enroute, dispatch announced that a woman was inside the burning home but would not leave until her dog was found. As emergency personnel rushed to the scene, the phone fell silent. Manitowoc Police Officer David McCue arrived first to the burning home and reported there was thick smoke and flames coming from the downstairs level extending up to the second floor. Officer McCue went around the outside of the home looking for the missing woman. He came upon the back door and was able to see her lying on the kitchen floor, under the heavy smoke layer. Officer McCue then made the decision that he would go inside and try to get her out. He first took a large breath, held it, and then proceeded to crawl under the smoke. With great effort, he was able to pull the unconscious woman outside onto the back deck where they were met by a fellow police officer, who helped carry her to a safe place away from the burning building. The victim was then attended to by Manitowoc Paramedics and regained consciousness. Her pet dog, Willie, fled the home as officer McCue opened the door and was later caught and found to be in good health. Officer David McCue is a past volunteer firefighter and is well aware of the dangers he faced during this rescue, but he was also aware of the danger Ms. Pieschel was in and that a moment’s hesitation could cost her life.